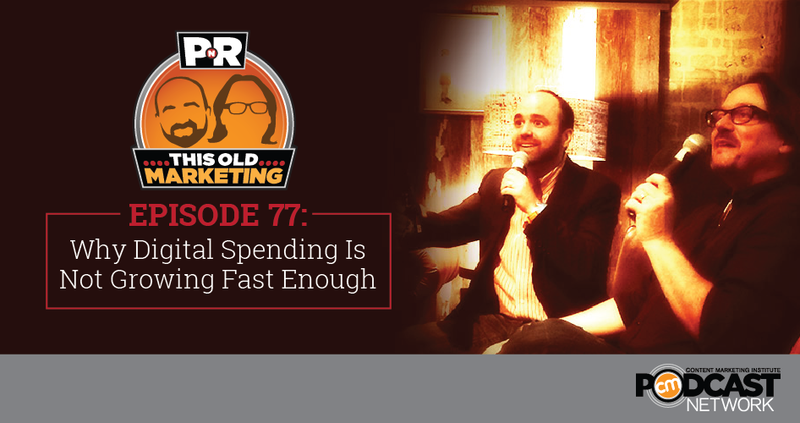 In this week’s episode, Robert and I question the accuracy of an article that claims marketers aren’t spending enough on digital. We also dissect a study that claims to provide insight on how to target three generations of consumers, and debate whether content companies are media companies, technology companies, or both. This episode also includes a short take on Google’s launch into content discovery with its intriguing new Matched Content service. Rants and raves include a savvy NFL draft pick and a poorly-conceived rant against Dove’s excellent Real Beauty campaign. We wrap up the show with a #ThisOldMarketing example from NFL Films. Why is digital marketing growing so slowly? (6:08): Even though it may seem like digital is ubiquitous to consumers, it’s actually not as pervasive as they think, according to this article from ClickZ. Digital was actually only 28% of the entire U.S. ad spend in 2014, according to research from eMarketer. I think it’s misleading to use this statistic because, in many cases, digital advertising hasn’t been very effective. Robert and I ponder the merits of a “digital first” versus a “digital only” strategy. Three ways to reach multiple generations with content (17:20): BuzzStream and Fractl have published the results of a research project they conducted to learn more about the content consumption habits of Millennials, Generation X’ers, and Baby Boomers. Among the report’s findings: The most- and least-consumed types of content are consistent across all three demographic groups. I’m extremely suspicious of the findings of this study, which don’t align with the research I’ve done. Robert and I agree that marketers need to focus on building an audience with engaging experiences and vary the messaging and marketing as needed to reach the niche you’re targeting. As content technology converges, publishers are feeling the squeeze (26:36): Is there a difference between a content company and a technology company? The answer to that question is becoming increasingly difficult to answer, according to this opinion column by Robert Sacks on Publishing Executive. Robert and I completely agree and point out that just calling yourself a media company doesn’t automatically differentiate you from the publishers and brands that are also doing so today. Brands and publishers have a common mission: Create compelling experiences using content. Technology alone is no longer a differentiating factor. Google gets into content recommendations with AdSense Matched Content (32:00): Google is getting into the content recommendation mix with a new tool for AdSense publishers. Matched Content gives publishers access to the familiar style of widget that appears at the bottom of articles. Google’s version includes only internal links within a publisher’s site for now. It could eventually expand to include paid links to external sites, similar to services offered by Outbrain and Taboola. Robert and I agree this is an excellent way for Google to leverage its existing technology in a powerful new way. This Old Marketing is sponsored by Fathom, a Cleveland-based digital marketing firm that has partnered with CMI on its B2B Manufacturing Content Marketing 2015: Budgets, Benchmarks, and Trends report for a number of years. 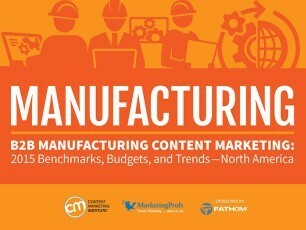 According to this report, 82% of manufacturers say they use content marketing now, but fewer than 30% say they’re effective at it; only a handful have a strategy defined. This report highlights best-in-class companies and strategies you can learn from and adapt to your needs. If you work for a manufacturer and have not seen this report, you ought to download it now. Joe’s rave: The Cleveland Browns recently drafted linebacker Hayes Pullard III in the seventh round of this year’s NFL draft. Two days before this event, Pullard sent a letter to all of the NFL GMs and coaches as well as The Players’ Tribune, Derek Jeter’s excellent sports website, telling his story and explaining his tangible and intangible qualities. It was a fantastic use of media by Pullard: He told a compelling story via channels that made sense for his message. As a result, he got drafted. Robert’s rant: Robert is a big fan of excellent marketing in general and Dove’s Real Beauty campaign in particular. That’s why he has a big beef with Digiday’s “copyranter,” who claims Dove “has passive-aggressively assaulted women’s physical insecurities to sell beauty products” for over a decade. Robert really takes issue with the author’s declaration that he knows more than us about how such ads are produced and his over-reliance of the concept of “authenticity.” Marketing isn’t about truth telling but what ought to be true, Robert declares. NFL Films: In 1962, Ed Sabol formed Blair Motion Pictures to film sporting events. Soon after, he won the rights to film the 1962 NFL championship game. The film was so good that NFL commissioner Pete Rozelle decided that the league should buy Sabol’s company. Renamed NFL Films, it received $20,000 in seed money from each team owner, and dedicated itself to producing game highlight films. NFL Films soon became known for its distinctive style – dramatic retellings of each game, close-ups of gritty football players, slow-motion shots of spiraling footballs in flight and booming, baritone-voiced narration. NFL Films played a big role in making pro football the most successful sport in America today. The NFL was far ahead of its time: Today, a growing number of companies are buying media services firms to enhance their storytelling skills. NFL Films is an outstanding example of This Old Marketing.